Share memorable moments of you and your loved one with the hashtag #1664BlancValentines on social media and stand a chance to win a Valentine’s date worth RM20,000! That’s not all! There will be 30 lucky winners who will stand a chance to win a carton (24-can pack) of Kronenbourg 1664 Blanc to savour this fruity, refreshing and aromatic wheat beer. All you need to do is post a photo of you and your loved one indulging Kronenbourg 1664 Blanc with the hashtag #1664BlancValentines on Facebook or Instagram. The social media contest runs from 1 February 2019 to 12 February 2019. 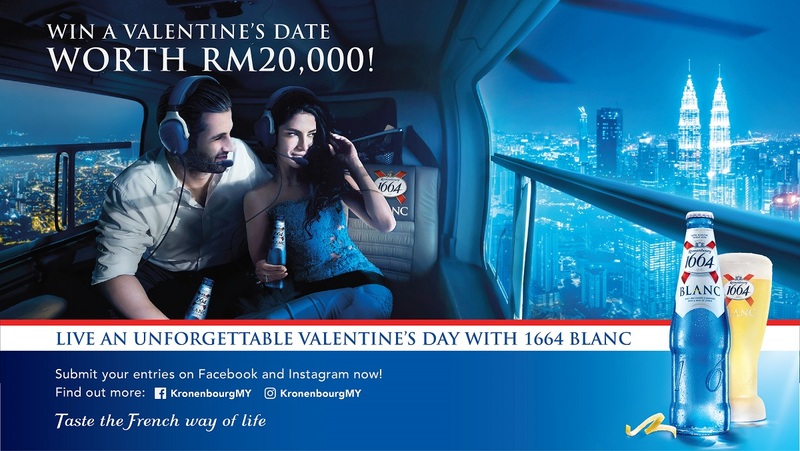 Winners will be announced on 13 February via Kronenbourg 1664 Blanc Malaysia’s Facebook page. This entry was posted in Party and tagged 1664 Blanc, beer, Blanc, french beer, kronenbourg, Kronenbourg 1664, wheat beer by TheGoodGoodGuy. Bookmark the permalink.